On 4 different occasions, the researchers had nine endurance athletes (cyclists and triathletes) cycle a 16.1 kilometer time trial. #1 On one occasion, the athletes were given a placebo and a fake irradiation 2 hours and 30 minutes before they had to cycle. #2 Another time, the subjects received a placebo, and their entire body was irradiated with UV-A light for 22 minutes. Per square centimeter of skin, the athletes caught 20 Joules of UV-A light. The amount of ultraviolet light that the riders received was equal to what a sportsman in cycling outfit would receive from sunlight between mid-12 and half-1 in the morning on a sunny day in southern Europe. 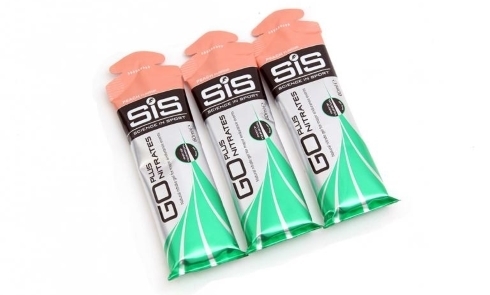 #3 A third time the athletes got 2 gels before they went cycling. Each gel contained 60 milliliters of a nitrate rich rhubarb and Swiss chard extract, containing a total of 8.1 millimoles of nitrates. The researchers used Science in Sport GO + Nitrates. At the same time, the athletes got a fake irradiation. #4 On a fourth occasion, the athletes were given a supplement with nitrates as well as an irradiation with UV-A light before they started cycling. The combination of radiation and supplementation increased the amount of nitrite in the subjects' blood, and improved the time the athletes needed to complete their time trial. This suggest that only in combination with UV-A light nitrates increase the amount of nitric oxide [NO] in the blood [first figure below] - and may improve sport performance [second figure below]. "The principal findings of the present study were that exposure to UV-A light subsequent to ingestion of nitrates improved the physiological responses to [...] and 16.1 km cycling time trial performance", write the researchers. "This study offers the intriguing possibility that a combination of naturally occurring environmental and dietary factors may coalesce to enhance cycling performance." "Researchers should also carefully consider the potential effects of natural sunlight exposure during study design and interpretation of their findings, given the important role of nitric oxide in energy metabolism and exercise performance." Nitric Oxide. 2015 Aug 1;48:3-9. Supplementation with beetroot juice - and probably also other sources of nitrate and nitrite - makes you a little cleverer. Researchers at the University of Maastricht in the Netherlands discovered this. 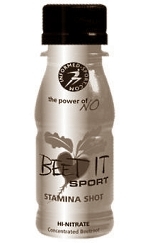 Beetroot juice is not only a good supplement for endurance athletes.